One of the four steps in the discipleship process at Fairview is CONNECT and one way we can connect is to share fellowship once a month over bagels, drinks, and goodies. 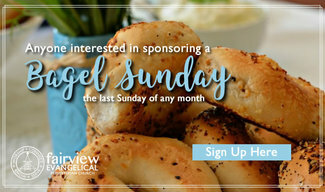 Traditionally, we celebrate Bagel Sunday on the last Sunday of each month. The "host/hostess" is asked to supply 1-2 dozen mini bagels, 1-2 varieties of cream cheese, 1 1/2 gallon juice or lemonade, and baked goods. As you may be aware, Fairview has a sweet tooth! Baked goods like brownies, cookies, donut holes, mini muffins or other sweet treats are the favorites among the young and young at heart. If you err, supply more baked goods and fewer bagels, unless you want leftovers! If you are short on time, store bought donuts and muffins are perfectly acceptable. SET UP // works best between Sunday School and worship so people can visit before worship and after. Please consider signing up to provide refreshments. You can even partner with a friend to share the work and expense! If you have any questions or need to change the date of a bagel Sunday, give me a call.